According to the 2010 edition of Operation World, Buddhism is the world's 4th largest religion. Did you know that George Lucas, Jennifer Lopez, Tiger Woods, Tina Turner and others have said they believe in Buddhist principles? Buddhism is on the rise, especially among young people. The kind face of the Dalai Lama appears to promise peace and reconciliation without "religion." That's the problem: Some people are now starting to call themselves Buddhist Christians and claim to "belong" to both. 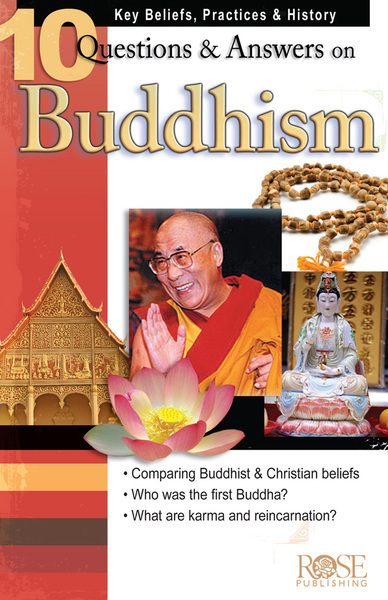 This pamphlet investigates the beliefs of Buddhism that every Christian should know. What's the Buddhist view of the Afterlife? What's the Buddhist view of Scriptural Documents? Is reincarnation, in the Buddhist view, as positive as people in the west think it is? Easy to read. Explains the Bible visually. Attractive. Full-color, packed with fascinating charts and illustrations. Easy to understand. Uses concise and simple language. Fast. This glossy attractive booklet can take less than 20 minutes to read. Engaging. 10 Q&A on Buddhism offers fascinating facts and handy study tips that revitalize individual and group Bible studies.